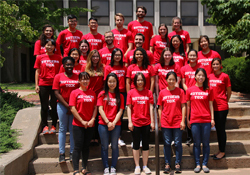 The Ernest Mario School of Pharmacy Summer Undergraduate Research Fellowship (SURF) Program. The program is intended for highly motivated undergraduates interested in a research career in the pharmaceutical and environmental sciences. Students are provided with an opportunity to conduct full-time research in areas related to Pharmacology and Toxicology, Environmental Health Sciences, Pharmaceutics, Medicinal Chemistry, Chemical Biology, and Clinical Pharmacy. The SURF program is open to undergraduate students currently enrolled at a university in the United States. Previous experience performing independent laboratory or clinical research is not required. The 10-week program provides a competitive stipend. Students must be available for the entire 10-week period. Training includes hands-on research conducted in the laboratories or clinical practices of faculty members, round table discussions of research progress, and seminars on research careers and activities of the faculty. Students also participate in career development workshops and a field trip to a pharmaceutical company. At the end of the fellowship, each student will provide a brief oral presentation on his or her summer research project.